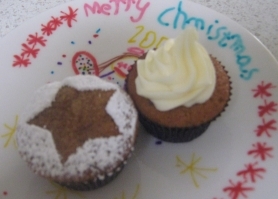 This Christmas Cupcake Recipe makes cupcakes which are a fantastic blend of ginger, cinnamon, nutmeg and golden syrup. Add to this a couple of tablespoons of fruit mince (or mincemeat) and you have a cupcake that is perfect for Christmas. Sift all dry ingredients together into mixing bowl and gently combine. Add buttermilk, egg, butter and golden syrup and beat on low speed until ingredients are combined. Increase sped and beat until mixture changes to a paler color. Fold in fruit mince (mincemeat). Let spice cupcakes cool completely before frosting with brandy buttercream or dust with icing sugar.